I submitted Deadbeat at Dawn back in July hoping to release it alongside Vigilante . The BBFC sent me a not entirely unexpected cuts list for Deadbeat totalling two minutes of footage. I made around fifty cuts to remove all sight of chain sticks and throwing stars exactly as they requested. Most of the gore in the film passed unnoticed. I resubmitted the film and started sending out preview copies, printed the sleeves, and ran a couple of ads, under the foolish assumption that because I had cut what they asked the film would be approved. Not so. Ferman watched it and through his secretary informed me that there was a problem with the violence in the film. A discussion was to be staged on the matter two days after the original release date: Oct. 26th. According to Ferman, opinions were split among the examiners. Then Whittam Smith entered the room, overruled all discussion and declared that the film was to be rejected. Democratic discussion! Anyway, Ferman said they didn’t want to issue another cuts list and that I could submit a toned down version if I wanted to. He had this impression of the film reaching a massive audience of impressionable. I told him that he ought to consider, in future, the actual market for a film of this type. 1500 units max! Not a huge blockbuster by any account, but a healthy specialist market. Jim VanBebber s notorious, blood-drenched cult classic Deadbeat at Dawn rises again on the advent of its 30th anniversary, newly restored for the first time on Blu-ray. 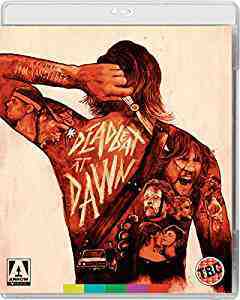 Locked and loaded with a raft of new extras, see Deadbeat as you ve never seen it before in all its head-busting, bone-crushing glory! Written by, directed by and starring VanBebber, Deadbeat follows the story of Goose a gang leader whose girlfriend is brutally slaughtered when he attempts to leave the thug life behind. Pulled back into the gang, who ve now formed an uneasy alliance with the thugs that butchered his girl, Goose sees an opportunity to exact his brutal, deadly revenge. Jim VanBebber, Deadbeat Forever! a brand new retrospective documentary on VanBebber and the Deadbeat legacy by Filmmaker Victor Bonacore, featuring first-time interviews, super-rare footage, VanBebber s college films and much, much more! Arrow Video is extremely proud to unveil not one but TWO as yet-unannounced forthcoming titles! SUBMITTED FOR YOUR APPROVAL: from the master Italian schlock, Ovidio G. Assonitis, the barmy 1979 sci-fi horror mash-up THE VISITOR and — for the hardened cult movie freaks amongst you — the infamous 1987 underground German shocker NEKROMANTIK!!! Indeed it has already been passed FULLY UNCUT by the BBFC. Pigs are flying as we speak! For the first time Film4 FrightFest is bringing its critically acclaimed Halloween event to the Vue West End. Six world, European, UK and London premieres over one intense 12 hour period on Saturday October 29th. and an amazing Surprise Movie. Tickets for all six films is £50. 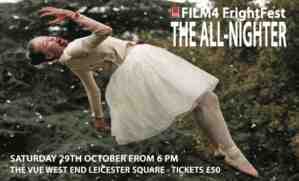 The film will see its UK premiere at Film4 FrightFest’s Halloween all-nighter at Leicester Square’s Vue on 29 October. Present will be director Tom Six and producer Ilona Six, to be accompanied by some of the cast. Eureka Entertainment, and Bounty Films (Australia), are extremely excited to be able to present The Human Centipede II (Full Sequence) at FrightFest. Fans of the first film are in for a fun-filled, stomach-churning, seat-squirming treat of the most nauseous. Tom Six has delivered us a villain who in years to come will be revered alongside Freddie and Jason. Presumably the film will be shown in the cut version approved by the BBFC. Eureka Entertainment is pleased to announce the forthcoming release of the controversial horror film The Human Centipede II (Full Sequence). When we first examined this work earlier this year we judged that, as submitted, it was unsuitable for classification; and, as we explained to the company, we could not ourselves see how cuts could produce a viable and classifiable work. That remains the view of one of our Vice Presidents, Gerard Lemos, who is therefore abstaining from the Board’s collective decision. In its original letter of 6 June refusing classification, the Board made clear that it was open to the distributor to attempt cuts. The cuts which have now been made are, in the Board’s judgement, necessary if the film is to be classified. Famously banned by the BBFC for a UK 1975 cinema releaseTobe Hooper’s seminal horror film was first seen informally by the BBFC’s Secretary, Stephen Murphy, on 27 February 1975. Murphy regarded it as a good, well-made film but felt strongly that the level of terrorisation, particularly towards the end of the film, and the film’s focus on abnormal psychology was unsuitable for a BBFC X certificate to be issued. The distributor reacted to this advice by making some minor reductions in the final scenes of terrorisation, formally submitting a slightly truncated version on 12 March 1975. After a long time in limbo it was passed 18 uncut by Camden Council in London for a Camden 1998 cinema release. It was given a late night screening at the 1998 London Film Festival and then ran successfully in Camden at the beginning of 1999. The notoriety of the film may owe a lot to its original rejection by the BBFC in 1975. It was passed for viewing in Europe, the USA, Australia and other countries. It received a GLC licence in the 1970s and was most recently shown in central London in 1998 under a licence from Camden Council. There is, so far as the Board is aware, no evidence that harm has ever arisen as a consequence of viewing the film. For modern young adults, accustomed to the macabre shocks of horror films through the 1980s and 1990s, THE TEXAS CHAIN SAW MASSACRE is unlikely to be particularly challenging. Unlike more recent examples of the genre, violence in THE TEXAS CHAIN SAW MASSACRE is throughout implied rather than explicit. By today’s standards, its visual effects may seem relatively unconvincing. Possibly the most notorious feature is the relentless pursuit of the ‘Final Girl’ throughout the last half hour or so of the film. The heroine in peril is a staple of the cinema since the earliest days. It is nonetheless legitimate to question the unusual emphasis THE TEXAS CHAIN SAW MASSACRE places on the pursuit of a defenceless and screaming female over such an extended period. The Board’s conclusion, after careful consideration, was that any possible harm that might arise in terms of the effect upon a modern audience would be more than sufficiently countered by the unrealistic, even absurd, nature of the action itself. It is worth emphasising that there is no explicit sexual element in the film, and relatively little visible violence. A solid, well-crafted giallo that delivers the goods without achieving classic status. Despite the title – and the opening quote from Freud – the film has minimal interest in character psychology. In fact, Mrs Wardh’s vice is little more than a plot device, though the weirdly-scored slow-motion flashbacks are certainly memorable. Sergio Martino stages some impressive set-pieces, aided by editor Eugenio Alabiso. While Martino lacks the artistry of Bava or Argento, he certainly knows how to make a movie.